A revamped and rebranded NHC Tour will be the richest in its 10-year history with a record prize pool totaling $400,000 up for grabs in 2017. The NTRA National Horseplayers Championship Tour (NHC Tour) is a yearlong bonus series offering additional prize money and qualifying berths to the NTRA National Horseplayers Championship (NHC), the world’s richest and most prestigious handicapping contest, formerly known as the NTRA National Handicapping Championship. Details of the 2017 NHC Tour were announced today by the National Thoroughbred Racing Association (NTRA), the founder, owner and operator of the NHC and NHC Tour. This year’s NHC Tour prize pool represents a 27 percent increase from the $315,000 offered in 2016. The NHC Tour champion will win $100,000 (up from $75,000 in 2016), with $50,000 to the runner-up, $25,000 to third, $17,500 to fourth, and $10,000 to fifth. 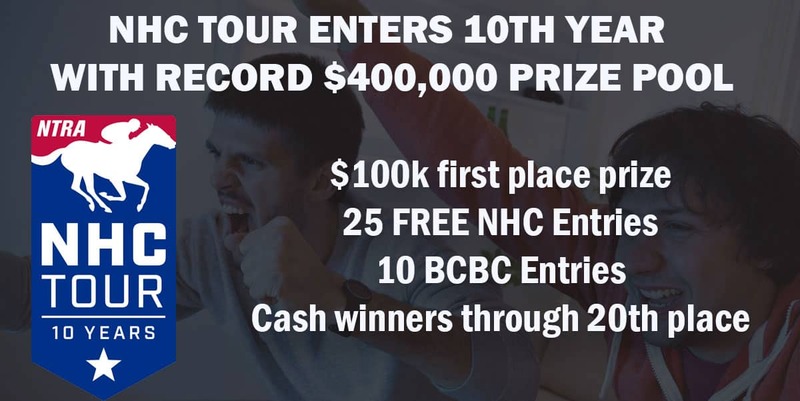 The top 20 finishers on the NHC Tour will win prize money, with sixth through 20th paying on a declining scale from $9,000 to $2,000. NHC Tour membership is mandatory to be eligible to qualify for the NHC. Membership includes free entry into five online “members only” contests offering a record 25 NHC berths (five more than in last year’s free online qualifiers). Those contests are set for April 8, May 13, June 10, July 30, and Sept. 2. The top five finishers in separate “First Half” (through July 30) and “Second Half” (July 30-Jan. 6, 2018) LUXAIR JETS Leaderboards will each be awarded berths to the next Breeders’ Cup Betting Challenge. In addition, a separate LUXAIR JETS Rookie Leaderboard for players that join the Tour for the first time in 2017 will offer $15,000 in prize money, including $5,000 to the winner. “This record prize money for the NHC Tour is a reflection of what continues to be unabated growth and interest in the NHC and NHC Tour,” said NTRA President and Chief Executive Officer Alex Waldrop. The NTRA also announced today that Equibase Company, the racing industry’s official database, is the new official data provider of the NHC and the NHC Tour, and its STATS Race Lens™ interactive past performance product will be a presenting sponsor of the NHC. The NHC is now officially the NTRA National Horseplayers Championship Presented by Racetrack Television Network, STATS Race Lens™ and Treasure Island Las Vegas. NHC Tour members interested in trying STATS Race Lens™ for the first time can purchase a one-month subscription and get two additional months at no cost by using promo code SRLQ129NHC at equibase.com. Online registration for the 2017 NHC Tour is available at http://ntra.kinsta.com/membership. A host of NHC qualifiers offering NHC Tour points are already underway. The next chances to earn spot in Las Vegas through online play are this weekend with contests Saturday and Sunday on HorseTourneys.com. A tentative schedule of contests for the calendar year will be announced next week. The Lexington-based luxury charter service LUXAIR JETS has acquired the naming rights for all NHC and NHC Tour leaderboards. The LUXAIR JETS NHC Tour Leaderboard and LUXAIR JETS NHC Tour Rookie Leaderboard are updated weekly throughout the year, while the LUXAIR JETS NHC Tour “First Half” Leaderboard and the LUXAIR JETS NHC Tour “Second Half” Leaderboard are updated weekly throughout their respective six-month seasons. All LUXAIR JETS Leaderboards are first posted and updated on the official NHC website at http://ntra.kinsta.com/nhc/leaders and also are e-mailed to the NTRA’s database of thousands of horseplayers. While the familiar acronyms remain, the NHC and the NHC Tour have had their official names updated to the NTRA National Horseplayers Championship (NHC) and the NTRA National Horseplayers Championship Tour (NHC Tour). The NHC was launched as the NTRA National Handicapping Championship in 1999 and its companion NTRA National Handicapping Championship Tour was introduced in 2008. New logos for the NHC and NHC Tour also were unveiled today. The marks utilize the NTRA logo and its red-white, and blue color scheme to emphasize the NHC’s unique structure as an industrywide collaboration involving nearly 50 partners, including racetracks, off-track betting facilities, race books, and horse racing and handicapping websites. The 19th NTRA National Horseplayers Championship Presented by RTN, STATS Race Lens and Treasure Island Las Vegas will be held February 9-11, 2018, at Treasure Island. The three-day extravaganza will unfold in Treasure Island’s state-of-the-art convention hall, expanding the footprint of the contest into newly constructed event space below the traditional contest ballroom that annually is transformed into the world’s largest race book. Treasure Island will play host to the NHC for a record seventh time. Equibase Company is a partnership between subsidiaries of The Jockey Club and the Thoroughbred Racing Associations of North America and serves as the Thoroughbred industry’s official database. Through its website and mobile applications, Equibase offers a comprehensive array of free statistical information as well as premium handicapping products and reports in support of the North American Thoroughbred racing industry. In partnership with STATS, Equibase developed the market-leading interactive past performance product STATS Race Lens™. Additional information is available at www.equibase.com. Founded by horsemen and aviation professionals and based in Lexington, Ky., LUXAIR JETS provides private aviation travel on a fleet of some of the world’s finest private aircraft through “on demand” charter jet service at fleet member pricing without any minimum or hourly buy-in requirements. LUXAIR JETS (luxairjets.com) also is an official partner of the Eclipse Awards.